The revival of brewing in Edinburgh, the Scottish capital, has been brought into sharp focus by the decision of one of its major players to appoint a senior executive with the task of building sales in the United States. Innis & Gunn has been the pacesetter in Scotland for developing oak-aged beers matured in casks bought from bourbon and whiskey distillers. 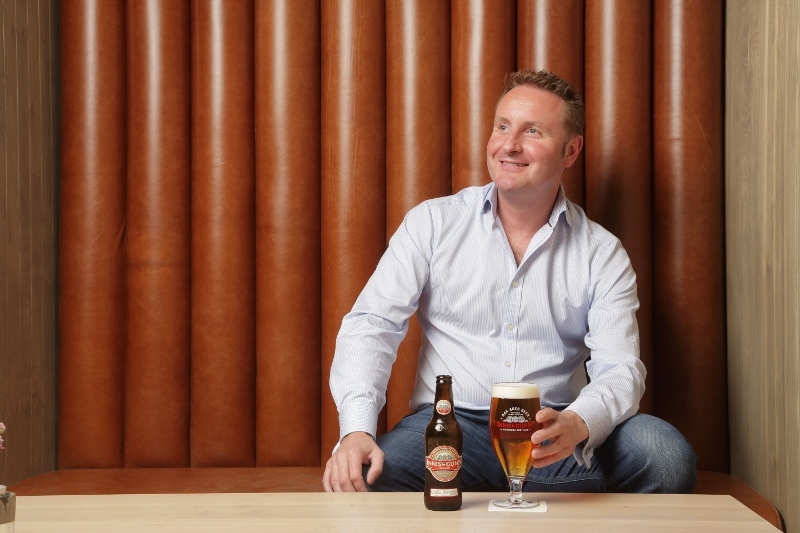 As well as selling in Britain, I&G’s beers have also built a strong base in Canada and Sweden and its founder, Dougal Sharp, feels the time is right to penetrate the American market. The company, set up in 2003, is a rags-to-riches story. Sharp launched the operation from his home in Edinburgh with a rickety laptop and a printer rescued from a builder’s dumpster. Today he has a large staff in roomy offices in the swankiest area of the city and he has recently signed-off a “crowdfunding” bond plan that has raised £3 million from new investors. He has used the funds to buy the Inveralmond Brewery in Perth, which produces conventional draft and bottled ales. At present, the I&G beers are brewed for Sharp by a Glasgow brewery but he plans to invest heavily in Inveralmond with new conditioning and storage vessels. Several other Scottish brewers, along with some south of the border in England, are now aging beer in wood, but Sharp was the pioneer. His first beer, Oak Aged Original, matured in casks obtained from American bourbon distillers, is his best-seller in domestic and overseas markets. But it’s been joined by a range that includes Rum Finish, Toasted Oak IPA, Irish Whiskey Finish, White Oak Wheat Beer and Bourbon Pale Ale. He has branched out, with considerable success, into the lager sector with a cold-fermented beer that he claims is now the second most-popular lager in Scotland. He has also gone down the retail route with Beer Kitchens in Edinburgh and Dundee that specialise in matching beer with imaginative food ranging from steak and curries to Caesar salads for both carnivores and vegetarians: he plans to roll out the concept to other Scottish towns and cities, including Glasgow. For decades, brewing in Scotland was dominated by two giant producers, Scottish & Newcastle (S&N) and Tennents. S&N was taken over by Heineken and its Edinburgh brewery closed. Tennents, based in Glasgow, remains the major player in Scotland with around 60 percent of the total market for its lager. But there is plenty of room for new brewers—and also for the Caledonian Brewery, which dates from 1869. Its Deuchars IPA is a major brand throughout Britain and a former Champion Beer of Britain in the annual competition staged by CAMRA, the Campaign for Real Ale. It’s brewed in traditional mash tuns, with copper kettles heated by direct flame. Heineken keeps a toe-hold in Scotland through its ownership of Caledonian but it gives the managers freedom to develop a wide range of ales that complement Deuchars IPA. The Dutch giant has invested £180,000 in a pilot brewery called Wee George, named after George Lorimer, the Victorian founder of the brewery. New beers are trialled in Wee George and if they find consumer support they are moved to the main brewery. As a result, brand leader Deuchars has been joined by a golden ale, oatmeal stout, Coast to Coast American-style pale ale, and Edinburgh Castle, a traditional malty 80 Shilling ale—the name stems from a long-defunct system of invoicing for beer based on strength. Flying Scotsman is similar to an English bitter and is named after a famous steam loco that is brought out on special occasions for trips from London to the Scottish capital. The new kid on the brewing block also has an S&N/Heineken connection. The Edinburgh Beer Factory is owned by John Dunsmore, former chief executive of S&N. He moved from there to the C&C group that owns Tennents Lager and he has a wealth of experience of the industry as well as cash in the bank. His brewery, opened in 2015, is far removed from many British micros that use second-hand kit held together with sealing wax and string. The custom built Italian Simtec brewhouse cost £1 million and has a capacity of more than 20,000 barrels a year. It’s multi-functional and can produce both ale and lager. But Dunsmore is determined to build slowly and carefully. He is concentrating on just one beer at present, a 5.2% Helles-style lager called Paolozzi. It’s named in honor of Eduardo Paolozzi, an artist, designer and sculptor who was born in north Edinburgh, the son of Italian immigrants. He is celebrated as the father of Pop Art and his many works include the cover for Paul McCartney’s album Red Rose Speedway. The full-tasting beer, hopped with German Hallertauer and Saaz varieties, is lagered for six weeks. Stewart Brewing at Loanhead a few miles outside Edinburgh, has carved a different route to success. The brewery opened with a nine-barrel plant in 2004 but moved to new premises with a 30-barrel kit in 2013. It can produce 12,000 barrels a year, needed to keep pace with the demand for the beer, 65 percent of which comes in cask-conditioned form. As a result of the baleful influence of S&N and Tennents, “real ale” has for many years had a limited support in Scotland but Steve Stewart is proving it can be just as popular in the north as it is in England. He learned not only brewing skills but marketing expertise in a career with Bass from 1995 to 2002. During this time, he went to the U.S. on an exchange program called “Leaders for Tomorrow” that included study at the Kennedy School of Government and work in industry. This included brewing at Harpoon Brewery in Boston, an experience that fired him with the determination to start his own brewery with his wife, Jo. Today they have a staff of 20—14 on the brewing side—with a large retail store and plans to add a restaurant. They have doubled capacity at the new site and, having run out of beer during last year’s Edinburgh arts and literature festival, are now installing new tanks that expand production. The fast-growing range includes IPA, Edinburgh No 3—a traditional Scottish “heavy” or bitter—80 Shilling and Edinburgh Gold. Recent additions include wheat beer, pale ale and Ka Pai, a South Pacific IPA brewed with nine Australian and New Zealand hops. Stewart Brewing also reaches out to the community. The 80 litre Craft Beer Kitchen enables local people to brew their own beers and have them professionally bottled and labelled. The small plant is also used by students and graduates at Edinburgh’s Heriot-Watt University’s brewing school to give them hands-on experience of the brewing process. Edinburgh has many attractions: a castle, a royal palace, an extinct volcano, the home of the new Scottish parliament and history by the wagon-load. And for beer lovers, it has superb pubs that offer the best of the capital’s ale.